Source: CICH graphic created using data adapted from Towards a Healthier Canada – Health Inequalities Data Table, Health Inequalities Data Tool, A joint initiative of the Public Health Agency of Canada, the Pan-Canadian Public Health Network, Statistics Canada and the Canadian Institute of Health Information. Data: Canadian Community Health Survey, 2009-2012. Children and youth living in the lowest income families are dramatically more likely to live with food insecurity – 27%, than are those living in the highest income households – 1%. Indigenous children and youth are more likely to live with food insecurity than are non-Indigenous children and youth. 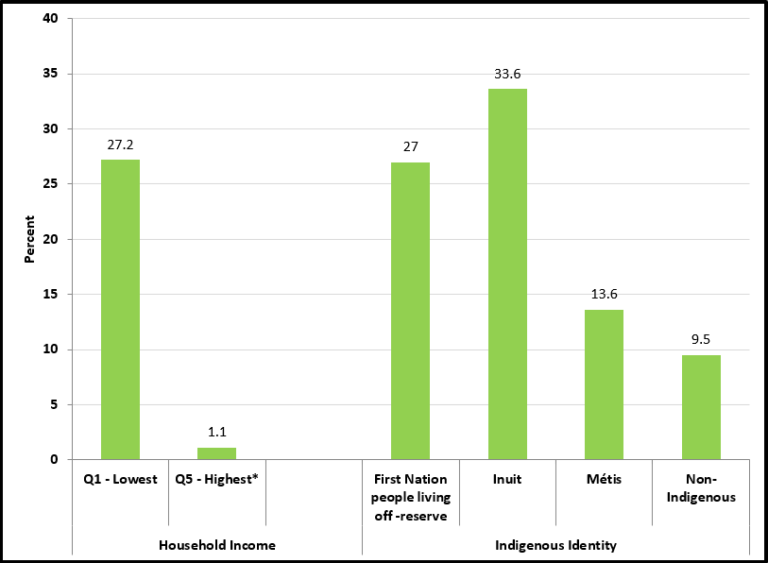 In 2009-2012, 27% of First Nations children and youth aged 12 to 17 years lived with moderate or severe food insecurity as did 34% of Inuit children and youth and 14% of Métis children and youth. That proportion was 10% for non-Indigenous children and youth in the same age group.